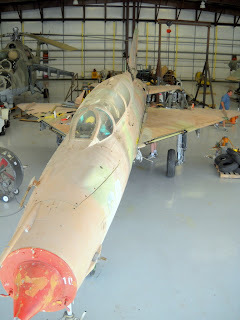 After attaching the tail, the Cold War Air Museum, Mig21 is ready for static display this weekend during the Sept. 5th airport open house. This practice run started with the tailpipe assembly. 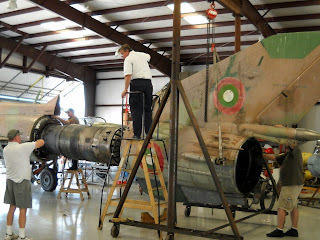 The work process gives us some useful insight into the aircraft systems and helps us determine what parts are left to be ordered or replaced before final assembly. 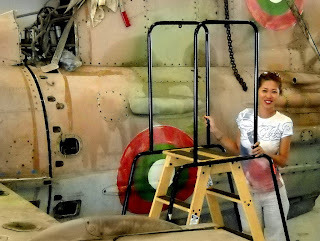 Slipping the tail out of the shipping cradle and rigging the lift frame (in the absence of a genuine factory tail cradle) gives the crew some practical experience. 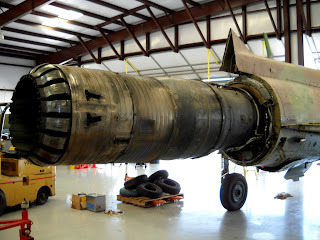 Different procedures will be used in final assembly to accommodate the many hookups necessary and allow the tailpipe to mate with its slip mounts. 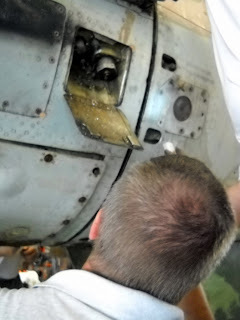 Like many military aircraft, the tail is attached with a ring of bolts that allows it to be easily removed for maintenance and inspection. For now, we simply need to insure that there are no connections or assemblies caught in the way. 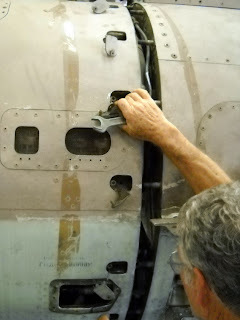 On final assembly, there are a myriad of mechanical, electrical, hydraulic and fuel connections that will have to be made while mating the wings and tail. Each one seems to demand incredibly small hands, fingers and tools working in impossibly tight spaces. The horizontal stabs slide over rotating shafts so that the entire surface is moved under hydraulic control. 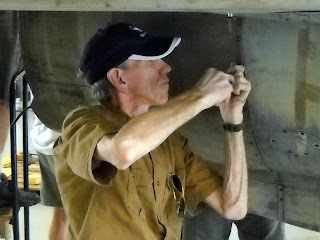 Our new hangar neighbor Pete came over to see what was going on and stayed to help attach the stabs and flaps. We really appreciated his help. This kind of help is an example of the great airport community we are lucky enough to be part of at Lancaster. With the tail on, the wings look even smaller than before. All hands help on the job. Lancaster Airport - Open this Saturday!